Up to 20,000 farmed salmon have been lost due to a jellyfish “bloom” off Clare island, Co Mayo. Aquaculture company Marine Harvest has said the losses occurred off Clare Island in the past few days, due to warmer sea temperatures which have seen similar occurrences at fish farms across Europe. 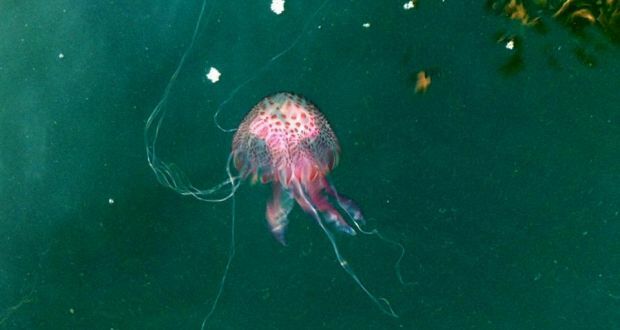 An “accelerated” harvest also occurred at its sea water sites in Donegal to try and avoid the impact of jellyfish blooms on the farmed stock. The company could not confirm the numbers of fish lost off Clare Island, but said they were substantial. The Norwegian company, which has 14 sea water aquaculture sites on the Irish west coast, has already been taking precautionary measures – feeding fish less to keep them less active, with gill covers closed – due to the marked rise in reporting strandings of jellyfish from Donegal to Kerry. Strandings of thousands of Pelagia noctiluca or Mauve stinger occurred in Ballyferriter, Dingle in late August, and in Donegal early last month. It was this species which inflicted losses worth over €1 million at a fish farm in Glenarm Bay, Co Antrim, in 2007 when some 120,000 fish died. That same season of 2007, there was an “exceptional abundance” of jellyfish from the Porcupine Bank right up to Rockall, according to Dr Tom Doyle of University College Cork’s Coastal and Marine Resources Centre, who was at sea at the time. Continuous plankton recording during marine research can detect jellyfish material, and it is hoped that some data may be collected during the Marine Institute’s autumn groundfish surveys off the west coast. However, Dr Doyle has said it is very difficult to confirm if this year is exceptional. He also says that some 15 to 20 years of data would be required before one could conclude that it was a cyclical occurrence, or an increase due to warming temperatures and/or acidification of seas. Dr Doyle curates the Big Jellyfish Hunt on Facebook, and was part of the EcoJel project, an EU-funded initiative involving UCC and Swansea University which noted a slight overall increase in biomass trends of jellyfish in the Irish Sea over 15 years.